This phrase: “Turning a Corner” keeps coming to me. It’s a new year. 2013. It’s a time of fresh starts. We didn’t go over the fiscal cliff (or did we, really). Maybe had they called it a fiscal corner we wouldn’t have rolled our eyes, and stock portfolio? Personally, I am turning a corner also. I have been unemployed since March 2011. Gad- that’s a long time. That’s regular work, paycheck work. It doesn’t mean that every day hasn’t been full and productive. I’ve been reading,… a lot. The usual suspects: Joel Goldsmith (of course), newspapers, Facebook, LinkedIn, Monster + other job-site search engines. I just finished a great little book that popped off the shelf at Powells Books. 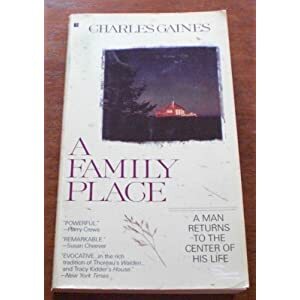 It’s called A Family Place by Charles Gaines. Gaines writes about the little cottage he, Mrs. Gaines, and their grown twenty something kids build in Nova Scotia. I should say, the wilds of Nova Scotia. He, in fact, turns a corner. 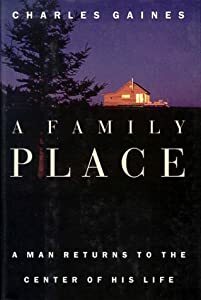 He realizes the money, the fame, and the social life he earned as a semi-famous author and screenplay writer have taken from him, the family world he had before all that fame. His marriage in shambles, his kids off in the wide-world. He turns a corner, wakes-up, and finds his life restored by the land, the act of building a small house together, and the spirit of renewal. I loved this book. I think you will too. So, enjoy the next leg of the 90-degree turn. You can always turn again, and again….to get back where you started. This entry was posted in Book Review, Great Information, Opinions?. Bookmark the permalink. 2 Responses to Turning a corner??? This looks interesting and relevant, I just added it to my library hold list:) We have recently experienced a bit of a turn-around in our employment situation also, and turning the corner has been difficult and frightening, but freeing the same. Best wishes for continued growth this year. Hello there! This article couldn’t be written any better! Reading through this article reminds me of my previous roommate! He always kept preaching about this. I’ll send this information to him.